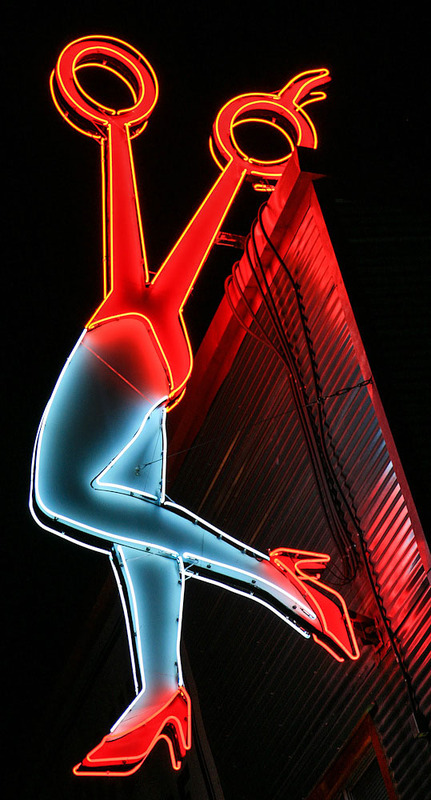 Cronie's is a place that is known for hot dogs with wieners that "snap." 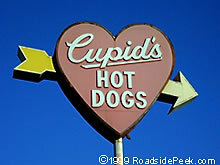 Cupid's Hot Dogs, located in the San Fernando Valley, is a hot dog joint that features a cupid like heart as its marquee. An interesting theme. Looking hungry and wanting to grab a wiener for lunch? 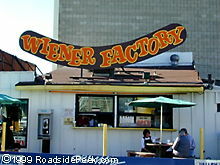 Then stop by the Wiener Factory and its appropriately shaped sign on top of its stand. In Japanese, oki means big. Looking for an Oki Dog? Then here's the place. Ever hungry for a home-cooked meal, but left with no time? You are then stuck with a choice between a TV dinner or fast food. 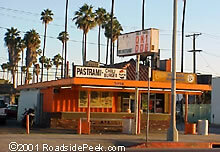 But don't despair, stop by the "home" looking place of Der Wienerschnitzel in East Los Angeles. Fast food isn't fast food without a chili dog or two. 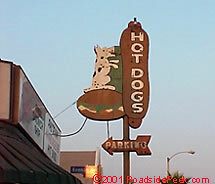 Here's a hot dog place near the Bob's Big Boy in Toluca Lake that's apparently famous for their breakfast burritos. 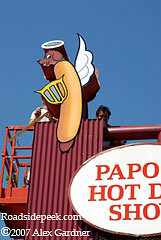 Welcome to Papoo's Hot Dog Show.